The LG 360 Cam is due very soon (expected release date in May 2016), and we even know the price ($200), but we don’t know a lot about the camera’s specifications. Well, now we know one more tidbit of information: the photo resolution will be 16 megapixels. 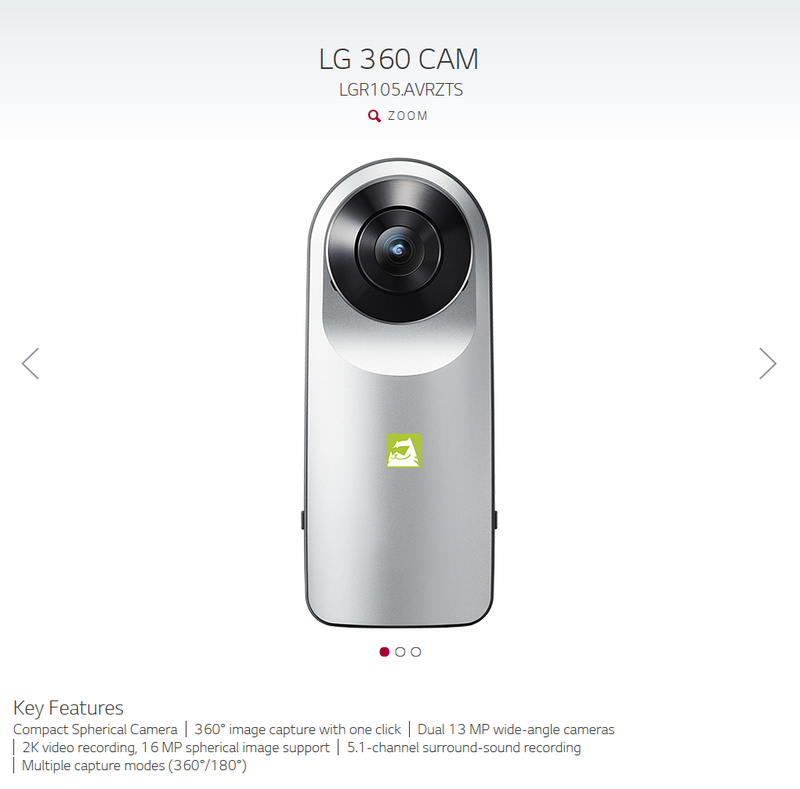 This specification showed up on the US version of LG’s new site for the LG 360 Cam, although it doesn’t show up on LG’s sites for other countries such as the UK. Note that the LG 360 Cam uses two 13mp sensors but seems to down-res them to 16mp. This appears to be similar to the approach used by Ricoh in their Theta cameras. The Theta S, for example, has two 12mp sensors, but the final image is 14mp. This contrasts with Samsung’s approach for the Samsung Gear 360 camera, which does not down-res. The Gear 360 has two 15mp sensors and the final image is 30mp. Limiting the resolution to 14mp may make it easier to transfer files, especially via Wi-Fi, and could save memory. As for image quality, it is not necessarily going to be worse than that of the Gear 360. For example, a Nikon D300 has only 12mp, while some consumer point and shoot cameras have over 20mp (e.g. Sony W810), but the D300 image would look more detailed and have less noise because the D300 has a much better sensor and better lens. In this case, note that the LG 360 Cam uses 13mp sensors, which is not too different from Samsung’s 15mp sensors (or the Theta S’ 12mp sensors). It hints that any difference in detail resolved will not necessarily be as great as their image file resolutions might imply. Without samples and without the chance to actually compare the cameras side-by-side, we won’t know which one has better image quality. The resolution for a photo using a single camera is 2468×1388 for 3.4MP regardless of the camera field of view setting at wide, medium, or narrow. This is almost like a toy camera. I cannot believe LG made this decision. Hi samski21. Thanks for commenting! Actually I now have this camera and I can confirm the photo resolution is 5660×2830. I dont know how you got the figure of 2468×1388. It seems that is only a crop of the entire photo. Pls let me know if you have any questions.